The night vision post processing effect I developed for GeeXLab has been ported to Blender Game Engine by a Blender user called Letun. I tested Letun’s work on Blender 2.49a and the demo works fine. 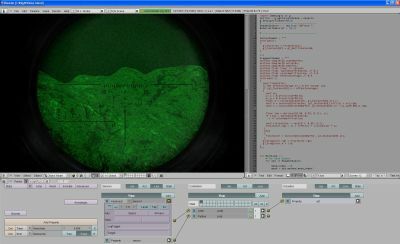 Remark: For the sake of speed rendering, the night vision effect is not used as a post processing filter over the final image. Rather, the shader is executed on a per-object basis (see the variable ShaderObjects). Have you read this: http://www.geeks3d.com/20091009/shader-library-night-vision-post-processing-filter-glsl/ ? I wrote the first version, JeGX improved it.